In less than ten years, social media has become communication professionals’ best friend and fickle foe. With relative ease, customers can be targeted, support can be organized, discussions can flourish and grievances can be aired with ease. Simply put, social media is more a more powerful communication tool than anyone could have imagined. The entrants in this program know this fact all too well. Rather than running from the challenge, they embraced it and have achieved amazing results. It is our honor to present, the winners of the 2013 Social Media Awards! In the fall, we put out a call for entries in this brand new program specifically for communications work on social media platforms. Professionals from around the world shared with us their stories, strategies and results. After hours of tedious review by our talented team of judges, we have compiled a list of the most creative and best-executed social media efforts from this past year. We invite you to read about their campaigns and help us congratulate the winners and honorable mentions. 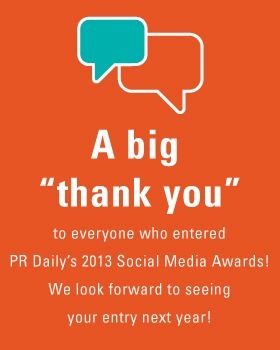 The staff of Ragan Communications and PR Daily would like to thank everyone who entered. We hope to see even more great work in our 2014 Social Media Awards opening this fall.